New Images From the Mondo's "Marvel Studios: The First Ten Years"
Marvelous things are currently afoot at the Mondo Gallery in Austin. On Friday, the gallery kicked off its “Marvel Studios: The First Ten Years” exhibition. 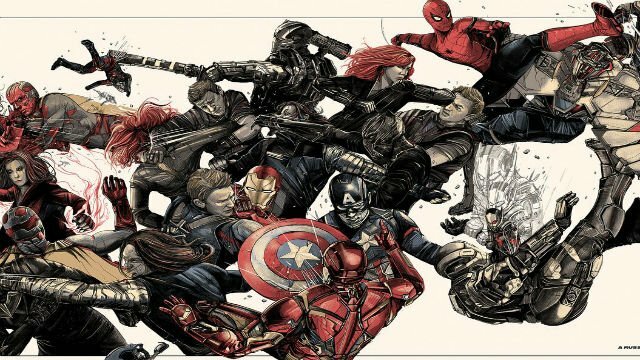 The event is showcasing limited edition poster prints for several Marvel Studios releases. As the name suggests, this showcase is being held in honor of the tenth anniversary of the studio’s first big release, Iron Man. 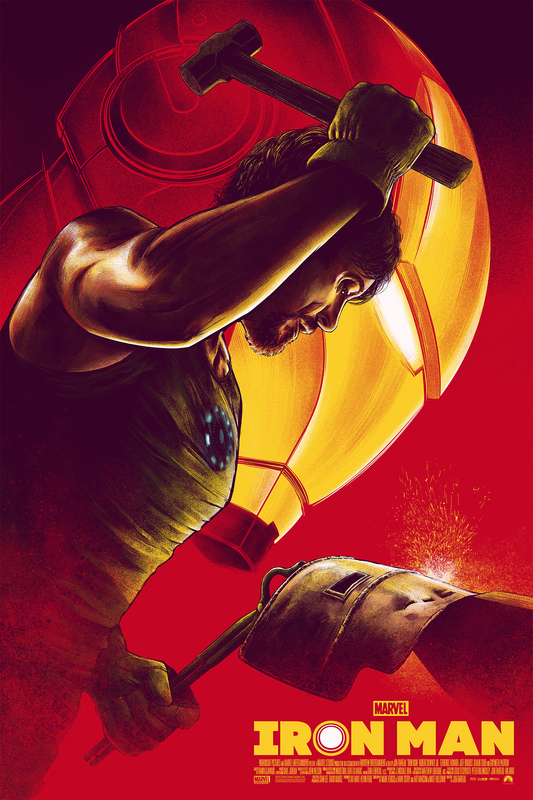 The postcard for the exhibition features artist César Moreno’s rendering of Tony Stark forging his Mark I armor while the familiar Mark III faceplate looms large in the background. Additional offerings include two variations of an Iron Man print by Chris Koehler as well as prints for all three Captain America films, both Guardians of the Galaxy installments, Thor, and Spider-Man: Homecoming. Some of the posters depict a specific event from a given film, such as the elevator fight scene in Captain America: The Winter Soldier or the airport battle in its follow-up, Civil War. Also memorable is Sara Deck’s Homecoming print, which is an obvious play on the famous poster for Ferris Bueller’s Day Off. Since that film derives influence from director John Hughes’ filmography, it only makes sense that she would pay homage accordingly. Marvel Studios previously rang in their tenth anniversary with a subtle tweak to their opening credits animation. In February, the actors and filmmakers released a massive class photo that also featured Mr. Marvel himself, Stan Lee. Prices for the posters are said to range between $50 and $80. The exhibit will run during normal gallery hours through October 20. But if you can’t make it, you can check out the images below and share your thoughts in the comment section!